Do you have back and joint issues that you badly need to solve? Inversion tables will help you with your inversion therapy that will not only solve your back and joint issues but will give you a lot of amazing benefits as well. 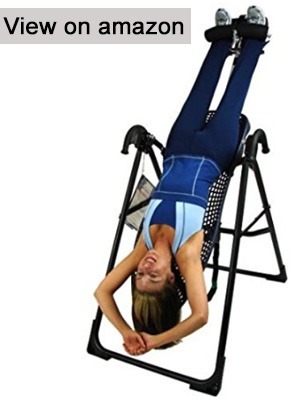 Using an Inversion table is easy and safe and will give you the relief that you’ve been waiting for. When choosing one BEST hang upside down machine in the market, this most famous brand should be Teeter. 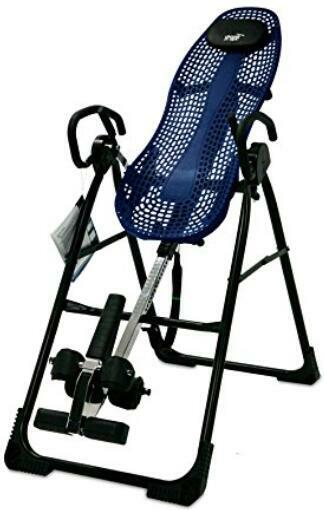 Why choose Teeter hang ups inversion table? How to select a right model fit you best? All you needs about Teeter hang ups inversion tables can be found in this page, let’s go! Check reviews of top model Teeter inversion tables and find one fit you best. 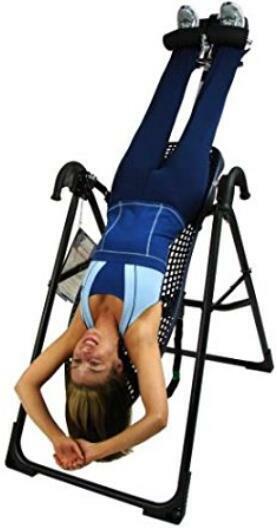 Inversion table is equipment that one can use to try inversion therapy. These are used to relieve the bad effects of gravity on your spine. Basically, inversion therapy is a technique of hanging upside down to decompress the spine that will relieve the pain and the pressure that you’re feeling. However, Inversion therapy is not for people with hypertension, glaucoma, or heart disease. It is highly recommended to consult your doctor first before trying Inversion therapy. Here are some issues that can be solved by using inversion tables. 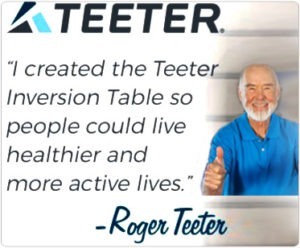 Why Choose Teeter For Your Inversion Table Needs? Teeter is not a newbie in the inversion table industry. This company has been making inversion therapy solutions for more than 30 years now and they are trusted by people who needs to have inversion therapy. There are a lot of reasons why you should choose Teeter Hang Ups Inversion tables for your needs and these are the following reasons below. – Teeter’s EP series inversion tables are UL Certified. This means that this company tests their inversion tables. Everything goes through a 30,000 cycle test to make sure that they are durable enough to be used. Your safety is very important if you’re going to hang upside down, so better choose inversion tables that are reliable enough since you are depending on the table’s strength to keep you safe while you are doing inversion therapy. And Teeter’s EP series will give you the assurance that you need. – The ankle comfort feature of the Teeter inversion tables will make sure that you’re not only secured properly on the table but is also comfortable for the clients. All of the inversion tables in the EP series are equipped with this feature to keep you safe. – There are also some bonus Stretch Tools that will improve the decompression on your body. – Whether you are a newbie on inversion therapy or not, the tables of the EP series are going to help you a lot with their precision rotation feature that can allow you to inverse in different angles. If you’re already comfortable with the inversion table, it can also allow you to have a full inversion. With this awesome feature, you’ll get your desired angle easily. – The Angle Tether of each inversion table in the EP series has a Preset Rotation Control feature. This will limit the angle of rotation when you use the tables. It is helpful for beginners and it can be removed eventually for relaxing full inversions. – If you have a small space in your house, EP series inversion tables are foldable and are easy to put away after you use them. By folding the frame, you’ll be able to fold it up and lay it against a wall to keep children from playing with it. 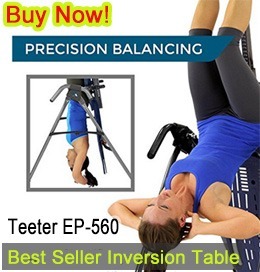 Teeter is well-known for their reliable inversion tables. They have been on the industry for years and they surely know what every client needs. If you’ve encountered the Teeter Hang Ups EP-550 and the EP-560 before which are the previous models that this manufacturer made, then you’ll also love their newer model. Taking the spotlight is the Teeter Hang Ups EP-560 that is an improved version of the previous models. Teeter Hang Ups EP-560 is packed with extra long handles so you will have more control and more options while using this table. It also has Accupressure Nodes that will add pressure on your back to help you relax and feel the soothing pressure in your muscles. Lumbar bridge support is also available for this model. It can support the grip of the table on your back and will provide you with a nice and comfortable pressure on the lumbar region of your back if you’re inverting at 60 degrees. This model is best for back pain relief. 5-year Full Warranty; 35-Year Legacy. 300 lb, 4ft 8in- 6ft 6in user capacity. Patented wrap-around ankle cups are made from specialty foam. Contoured Bed with Hand Grips flexes. Auto-locking hinges, cam locks, specialized pivot bearings for durability. This table is made for the user’s comfort and support, and it is the Only FDA-cleared inversion table for back pain relief. Teeter made sure to include wrap-around ankle straps to provide you with a safe and comfortable way of securing your self in the table. The contoured bed flexes are also designed for maximum relief and to give the best stretching experience for your body. If you’re still in doubt with this table’s durability, then you should know that it is made of heavy gauge steel parts. 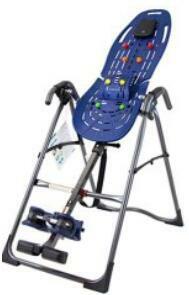 It boasts of cam locks, safety locks activated by gravity, and special pivot bearings and it will ensure that it is not just another inversion table. It is made of the best materials for the best quality that users like you should have. There are three other inversion table models made by Teeter that you can choose from depending on your needs and preferences. These tables are well constructed and have different features. Each of them have special aspects that you should look into when buying one. Here are the three models and their distinctions from each other. 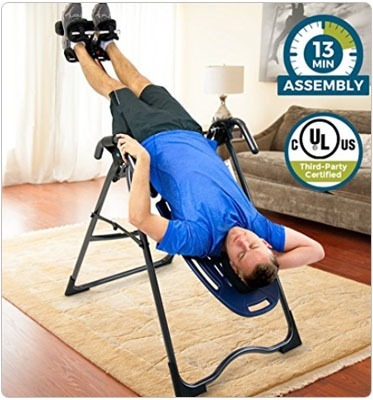 This inversion table is for people with back pain or just wants to improve their posture. Although it doesn’t have the Acupressure nodes that the EP-560 has, this table is still one of the best ones out there because of its Backrest with Flex Technology that offers ranges of motion for the users. These are the EZ Angle Tether strap and the adjustable pillow. This table will elongate the spine and relieve the pressure on discs, ligaments and your nerve roots. Unlike the other inversion tables in this series, the EP-550 is equipped with two settings for the adjustable foot platform. If you want an inversion table that is more premium and can relieve you from more back and posture issues, then the EP-950 is a good choice for you. Precision balancing, responsive rotation control. Pre-set markings at 20, 40, and 60 degrees for easy adjusting and rotational control. Large handles provide assistance, support and even more stretching options. Removable head pillow attached right on the Bed with customizable placement. Adjustable foot platform height for smaller or larger feet to ensure a comfortable fit. 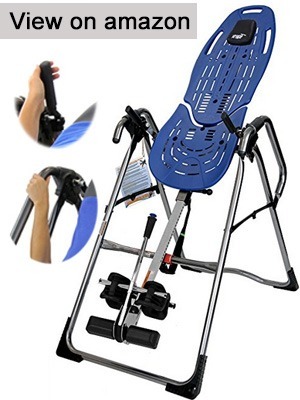 This inversion table is imported and is made of plastic and steel. Instead of having lumbar bridge support for your back and Acupressure nodes, it has a patented flex technology that can also give you a greater range of motion while using it. If you compare this model with the EP-550, it only has EZ Angle Tether straps for your rotation angles. And for your ankles, it has a ratchet lock system to keep you secured. This table’s surface is smooth and has low friction so you can have an optimal stretch experience. 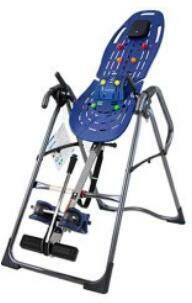 This inversion table is Teeter’s top of the line model for the EP series. The Teeter Hang Ups EP-970 LTD comes with lots of features that you can adjust according to your preferences. The Acupressure Nodes feature in this model has two sizes and can even be inserted anywhere in the table’s ComforTrak. This option will give additional pressures on your spine’s muscle for more relief. Feels very studry without wobble while using it. The EP-970 also has different handles compared to the other models. The StretchMax handles are longer and has embossed angle guides for different level users. As well as the EP-560, this will also give you the benefit of the lumbar bridge for your lower back area. For its safety features, EP-970 has an ankle system called Deluxe EZ-Rreach. This means that you’ll have a safety lock, smooth ratchet closure, and stainless steel with aero-space grade. The handles are also longer so you won’t need to bend when securing your ankles in the table unlike in the previous models. You can try this excellent model with less than $200! People have been using inversion therapy because of its proven benefits for the body. And inversion tables are a great help to achieve the optimum benefits of this therapy. The Teeter Hang Ups EP-560 is an inversion table that you can use whether you are a beginner or not. It is user-friendly and includes features that will give extra comfort, benefit, and relaxation to soothe your back pains and improve one’s posture. The four EP series models each has their special and unique features that you can enjoy. If you’re looking for a basic inversion table, then the EP-550 is for you. But if you need something that will give you more options while using an inversion table for therapy, you can opt for the EP-950. This table’s premium features are good for people who wants to have the best stretch experience because of its smooth surface. 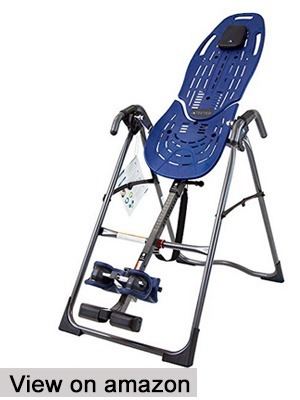 If you want an inversion table that has customizable features for a great inversion therapy experience, the EP-970 would be the best for you. It will not disappoint you because it is very efficient and easy to use. But, getting the EP-560 is still very commendable because it can offer you the best comfort. Although this model is not the top of the line, it still gives you the acupressure nodes and lumbar bridge support for an average price. Choose One You Like Best! However, the choice is still yours to make which of these models best suits your needs and your budget. Whichever you choose, you’ll get a five-year warranty for each of them and a guarantee that these are the best inversion tables that can help you with your inversion therapy. Why Choose Teeter Hang Ups?